Why Are We Industry Leaders? Founded in 1970 by three brothers in Southern California, SUNDEK originated as a family business and has grown to become an internationally recognized leader. The basic technology of combining Portland cement, silica sand and plastics as a repair and maintenance procedure for large, existing concrete projects has been used for more than 70 years. However, SUNDEK reformulated the central premise of this technology to create a coating that could be applied as a remodeling finish over existing concrete surfaces. A few years later, the company added a breathable-finish coat process to facilitate ease of cleaning and repairability, which brought a maintenance aspect to our business, and is one of the keys to the success of our process. The family of SUNDEK coatings was later further expanded to include SUNDEK® Masonry Effects, giving us unlimited design capabilities—and the demand for our products increased dramatically. In the early 1980s, SUNDEK management created the SUNDEK Dealer Program. Founded on a strong commitment to each dealer, this initiative was launched based on a set of distinct premises, including the provision of an exclusive geographic area to each dealer. This allows every dealer to sell and install SUNDEK with strict quality control of the application process, and without the worry of direct competition from other dealers. The ‘90s brought innovation in the form of various effects to enhance the capabilities of our existing systems. Custom Scoreline Effect was a game-changer, as we developed a process to incorporate cracked concrete into a custom pattern of nature-made and hand-made scored designs to camouflage the cracks. This concept of working with the elements resulted in SUNDEK Aggregate Effects: multiple dots of colors applied to the surface to help hide dirt and debris, and provide a maintenance-friendly surface. The new millennium continues SUNDEK’s reputation as THE concrete coating of choice. We use that reputation to introduce our expanded system offerings such as our garage floor epoxies and more. Today, SUNDEK is owned by parent company The Coatings Group, and proactively focuses on dealer development, training, and support because we realize that our success depends on yours. We gladly offer all of our resources, experience, knowledge, and training to help you realize your financial objectives. Superior Products: Recognized as a market leader and continuous innovator, SUNDEK® pioneered the decorative concrete industry, and our products have a proven track record dating back to 1970. To meet the needs of commercial and residential customers, we have assembled a broad array of high-quality products, including interior and exterior solutions, some of which we manufacture, distribute and install, and others that we simply distribute, both on an exclusive and non-exclusive basis. Continuous Innovation: Always ahead of the curve, we are constantly developing new products and applications. Stamped, custom hand-troweled and spray-textured systems, as well as a variety of stains, sealers, epoxy and polyaspartic coatings, are part of the SUNDEK portfolio of products and services. Our constantly growing line also includes SUNDEK®, Americoat, and MasterCoat, and covers a wide range of surfacing needs. Exceptional Testing Procedures and Warranties: SUNDEK is one of the few deck coating materials to receive widespread public approval in all climate conditions. SUNDEK is subject to rigid quality criteria for application, and is one of the preferred coatings to be approved by testing authorities and specified by leading architectural firms and national account managers. Unlike others, we conduct many different climatic zone tests, ensuring that our products work well in warm and freezing temperatures. The SUNDEK warranty literally offers the best guarantees in the industry and that is a key differentiator for our customers. Relationship Management (CRM) tools, and lead-generation assistance. These comprehensive support services allow you to focus on growing your decorative concrete business and realize your goals. Financial Models and Reporting Assistance: We assist our dealers with managing the financial part of the business. We do this by providing standardized charts of accounts, target profit and loss statements, and even end-of-year annual reporting if desired. Utilizing this information and service within your exclusive territory, protects your investment now and well into the future. 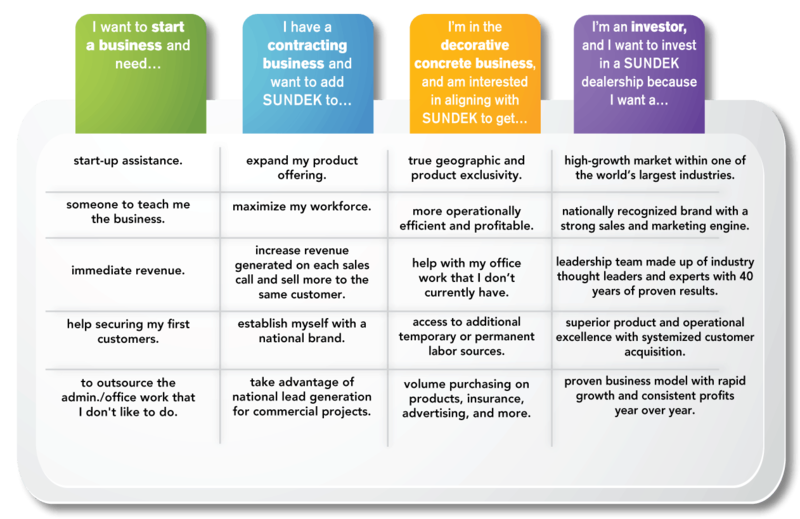 The Model Dealer Program business system: When you become a SUNDEK dealer, we’ll give you the road map for success. We provide benchmarks such as the standard number of square feet per job, the typical number of leads required to produce a given number of jobs per year, the number and types of personnel necessary for the size of your dealership, and the quantity and type of marketing materials needed to produce a certain number of leads. Every year, all SUNDEK dealers have the opportunity to meet, train, learn, and share ideas with one another on everything from products to management to current trends. Industry experts and business specialists are invited to help you manage and grow your business. Our Awards Banquet is a can’t-miss event where the best in the industry get rewarded for their hard work.